There is a shared lounge, terrace and a bar. Free WiFi. Hostal Bonany is in a good location, not far from the Marina, west of the Old town, yet an easy 20 mins walk into the trendy Santa Catalina district. This hostal's rooms all look newly modernised with fan's rather than airconditioning at this budget, but they have private bathrooms, balcony or terrace, TV & free Wi-Fi. There is a swimming pool, set in attractive gardens, a bar and TV room. PC's available. The hotel has an outdoor pool and terraces with sea views and a bar & buffet restaurant which serves a selection of Mediterranean cuisine. A bike friendly hotel, has a special menu for athletes as well as treatments and massages. There is a bicycle repair shop too. Airport shuttle available. Located in Palma’s Ciudad Jardín area, the hotel is about 5 km from the city’s historic centre... Its on a lovely beach with cafes and restaurants and the seafront promenade, great for walking or cycling into the Old Town... There is a large outdoor swimming pool, bar and Italian restaurant, free Wi-Fi. Located to the west end of Palma bay, but within easy reach of the Old Town, marina and beach..
With a pool and terrace in gardens... On site Fitness centre. 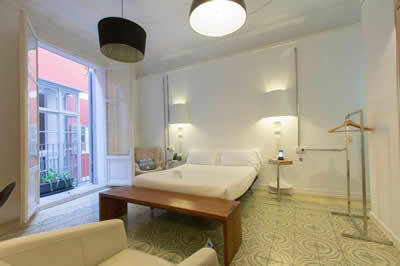 This cool modern hotel is located 10 -15 minutes walk from the Old Town. 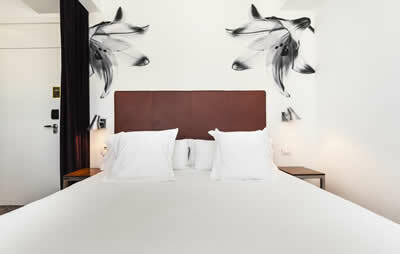 It has a stylish minimalist vibe, air-conditioned rooms, free Wi-Fi, plasma satellite TV and a minibar. A wonderful buffet breakfast is served in the stylish lounge... Visit the stunning roof terrace and chillout areas with a beautiful plunge pool with views of the City.. 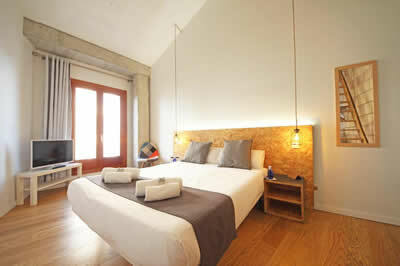 This quirky, stylish & arty hotel is located very centrally down one of the cobbled lanes near the tree lined avenue of Passeig del Born.. Each room has its own unique theme, a flat screen TV, airconditioning and free Wifi... Suites and Premium Rooms have a private terrace. Family rooms available. 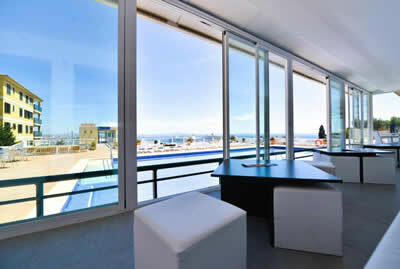 There is a roof terrace with chillout sofas where you can relax in the sun, a gym centre, bar and restaurant. Once the 16th century Marqueses de Ferrandell Palace, this lovely hotel is full of faded grandeur, a hidden gem and lots of old world charm... a sympathetic mix of modern bathrooms and generous bedrooms with antique furnishings.. 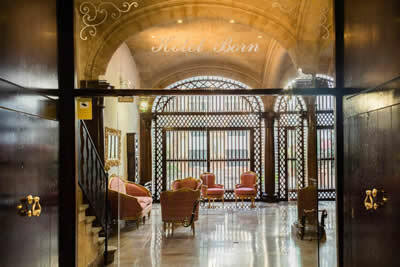 Very convenient for exploring the Old Town, just north of the grand classical shopping street of Avenida Jaune 111 and Passeig del Born..
UR Palacio Avenida is converted from an old 1942 cinema, near to the station but just 10 minutes walk to the Old Town. 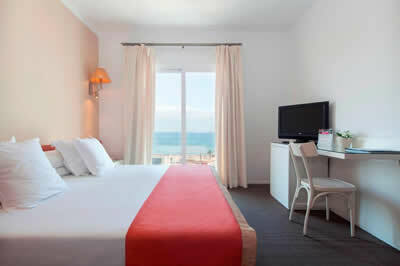 It offers stylish rooms, designed by Bruno Borrione, from the Philippe Starck studio, with free Wi-Fi, flat-screen satellite TV, bar and room service. Adults Only. Overlooking Mallorca’s Palma Bay, this hotel features an outdoor pool, indoor pool, hot tub and small gym, a large sun terrace with a poolside bar. 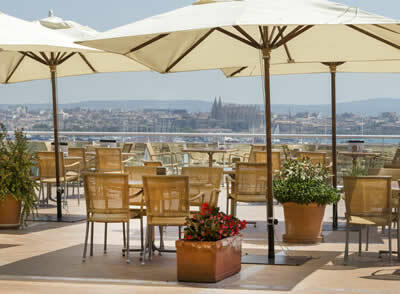 Stunning views of Palma Harbour from the restaurant. 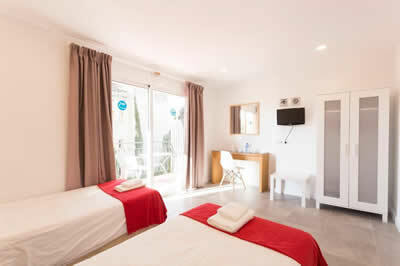 The ensuite rooms come with airconditioning, satellite TV, balcony, with room service available & free WiFi.